913 064 visitors. This is the impressive number of visitors has hosted a major retrospective Claude Monet, 22 September 2010 to January 24, 2011, in the Galeries Nationales du Grand Palais. Six hours. It’s time that had to wait more motivated in the cold and sometimes rain, to discover the works of master impressionist. So much so that hot and cold drinks were distributed free in the queue. 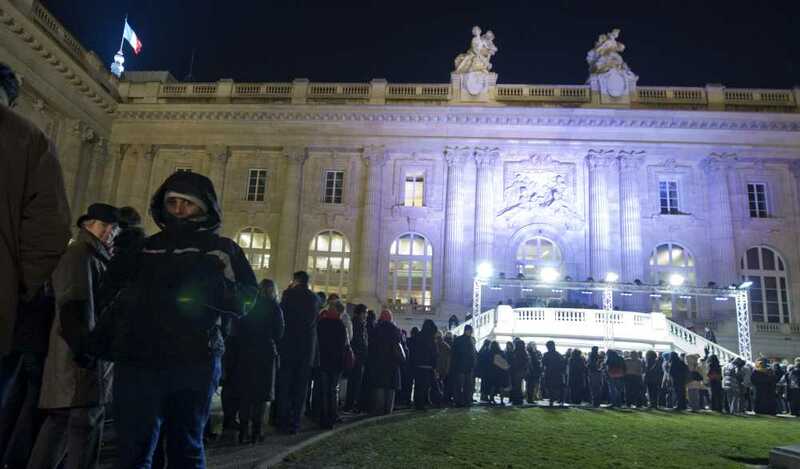 No exhibition had been so successful in France for over 40 years, announces la Réunion des musées nationaux, co-organizer of the event with the Musée d’Orsay. It is his neighbor who had seen Petit Palais better in 1967 when he hosted the mysterious and legendary pharaoh Tutankhamun: 1.2 million people had then made the trip, knowing that the show had lasted longer-six and a half months instead of four. It bodes well for the crop in 2011: the opening of the exhibition, organizers expected 500,000 visitors. It must be said that the organizers had given them the means. This monographic exhibition was “the most important event dedicated to the artist for nearly thirty years (in France, ed), when the National Galleries was held in 1980 in a retrospective form of homage,” according to the site of the la Réunion des musées nationaux. The retrospective at the National Galleries aim was to trace “the route rich and fruitful,” the beginnings of the 1860s to the final round tables related to the Water Lilies of the Orangerie Museum. She had to do no less than 170 paintings from around the world. Indeed, if some fifty works were almost close to the museum Orsay, others were borrowed from foreign museums and even private collections. Thus, some paintings have traveled from the United States or Russia. Claude Monet, born in Paris in 1840 and died in Giverny in 1926, is considered the father of Impressionism. Halfway between realism-initiated several years earlier by Gustave Courbet and pointillism, which emerge later with Georges Seurat, his art sought tirelessly to beauty, without distorting, what the world had to his penetrating gaze. His series on Rouen Cathedral, Parliaments, representing his eternal and meticulous work on the light-but also his incredible Uncountable and Waterlilies-reflecting his obsession with games and mirror reflections of the water-or even its Gare Saint-Lazare, her Poppies, his painting of the suburbs in general, or the Normandy coast, show among many other works of his timeless genius of the French master. 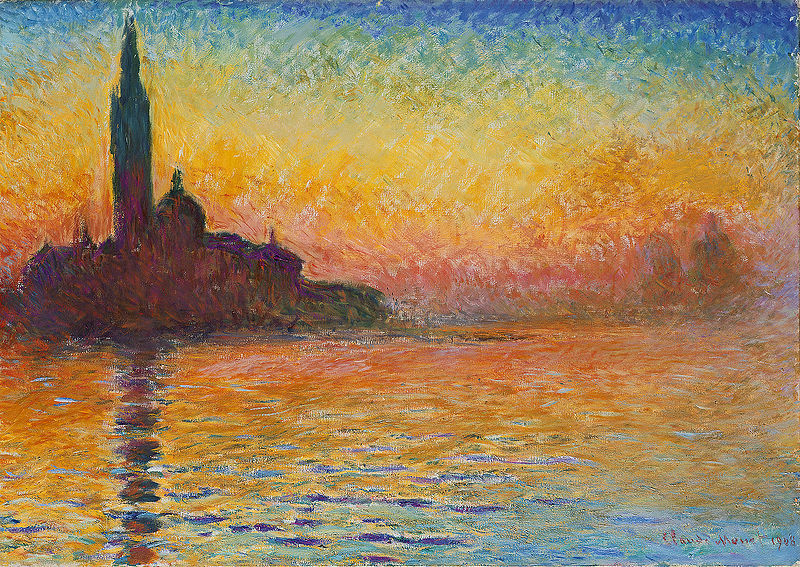 San Giorgio Maggiore at Dusk is an oil painting by Claude Monet that was painted in 1908. The painting is owned by National Museum Cardiff, the national art gallery of Wales. The painting received substantial public attention as the focus of John McTiernan’s 1999 remake of The Thomas Crown Affair, a heist film where the painting (identified as being worth $100 million) is stolen by a billionaire, played by Pierce Brosnan. It is sometimes known as Dusk in Venice, or Sunset in Venice. San Giorgio Maggiore is an island off of the coast of Venice, Italy. Such a beautiful piece of art. The six hour line up just demonstrates how many people are still so passionate about the old Masters!! Thanks for the information very interesting!